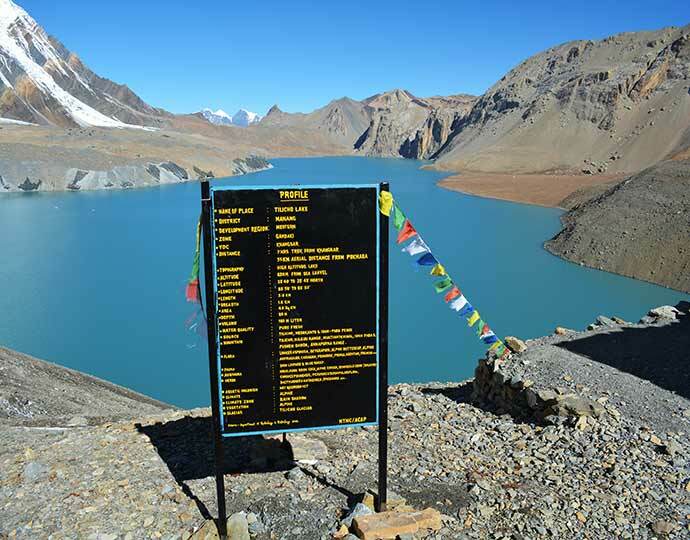 Tilicho Lake is the highest lake in the world at 5200m. The lake lies on the north side of the Annapurna Himal, just below Tilicho Peak(7134m). 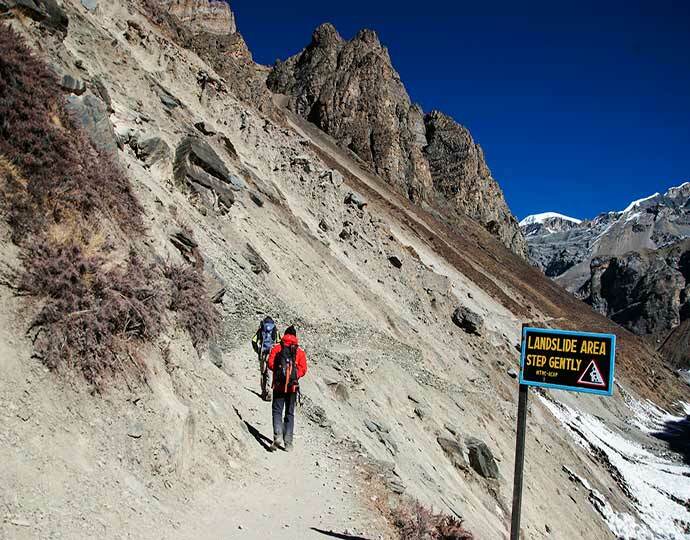 Reaching it is not easy as the route rises to the Mesukantu-La pass at 5,300m. But it is an exciting and beautiful route. 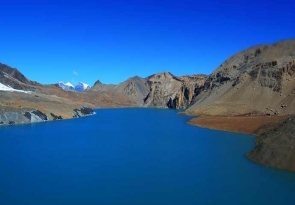 Offers the fascinating insight into the life of middle hill Nepalese, ethnic groups from Hindu farmers to Tibetan Lamas, incredible views of many of the Himalayas’ most famous high peaks, crystal clear lakes. 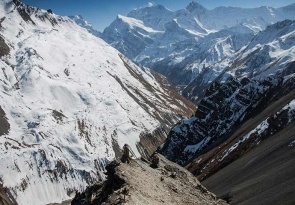 Himalayan Sights: Whole Annapurna Massief, Dhaulagiri ranges, Manaslu, Tibetan Plateau. Arrive in Kathmandu and transfer to hotel, Depending on your arrival time you will have choice of visiting nearby sanctuaries or rest of the time free for leisure. 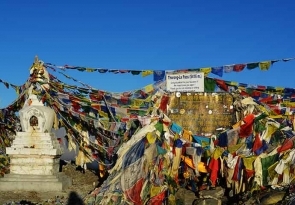 Half day sightseeing around Kathmandu, where you will have time to fascinating Buddhist and Hindu temples and shrines reflecting ancient local tradition are highlighted on by guided tour. There’s time to explore the city’s many charms on your own or take a rest while finalize trekking permits. It takes about 6/7hours drive by bus. Besi sahar where the road ends and we will not se-motorized vehicles for the next three weeks. Approximately 6 hours and 500m ascent but we get some nice views of nearby villages, waterfalls and look back at small and the terraced rice fields. The trail winds through rice paddies and thick forest, occasionally crossing to small and large bamboo bridges. Day 5: Bahun Danda - Chamje (6/7 hrs,1715m) o/n in lodge (B.L.D). 6-7 hours and over 400m ascend. About 500m ascend –Tal (lake). There is natural dam on the river Marshyandi that formed a small lake with an actual beach, and a nice waterfall on the other end of the town. Several stiff rises with length of Marshyandi River. (7hrs) Overnight at Bagarshhap. About 500m ascend. 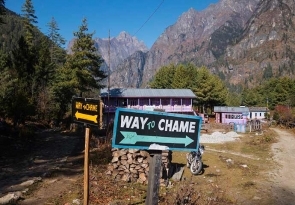 Chame is a pretty major town with a bank, health-post, electricity and beautiful view of Lamjung Himal and more than that it also has got hot spring. We are in Manang district. The architectures of the village changes. It takes about 5½ hours. 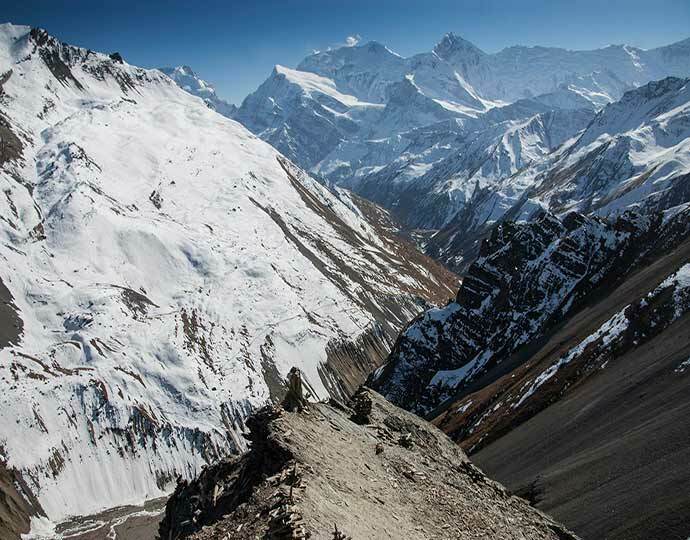 This town is now mostly a collection of lodges with the views of Pisang peak, Annapurna II. 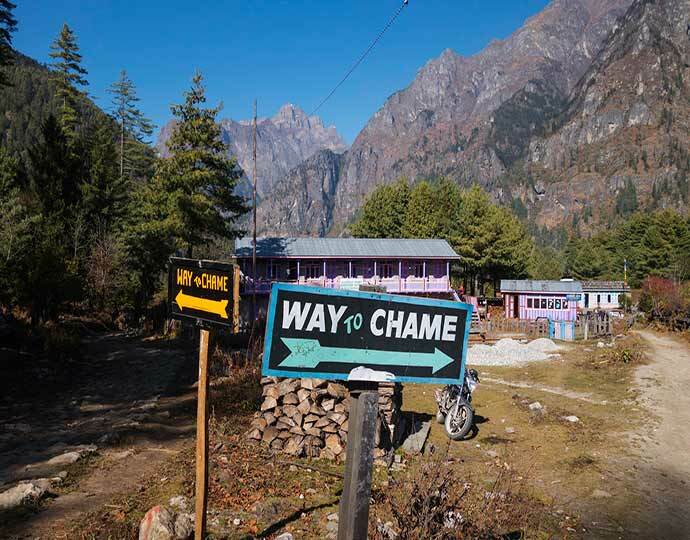 Walk up to the camp, located at the foot of the hills taking lunch break in Yak Kharka. 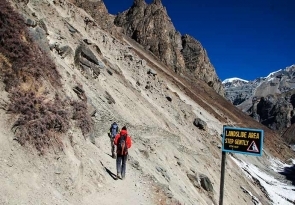 If we don’t feel much tired then we can further hike up to High camp so that It would be easier to cross Throng La. 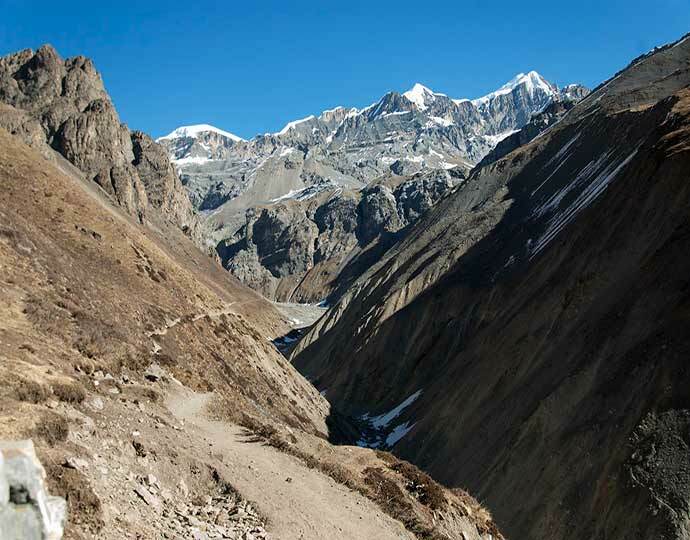 Departure early in the morning to climb Thorong (5416m) and descent towards Muktinath. 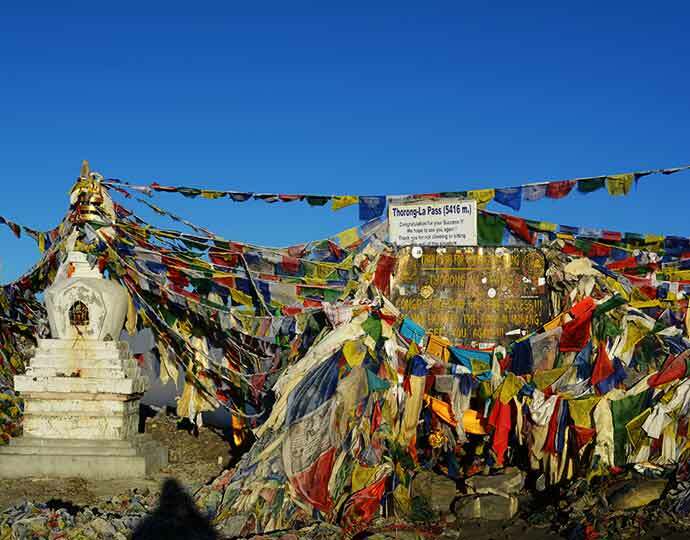 (8 hrs) Muktinath temple is a point of pilgrimage for Buddhist and Hindus where flam, water, air meet. 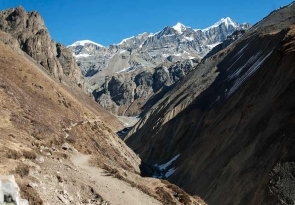 We cross village of Jharkot and kagbeni easy stage on an old road of caravans. 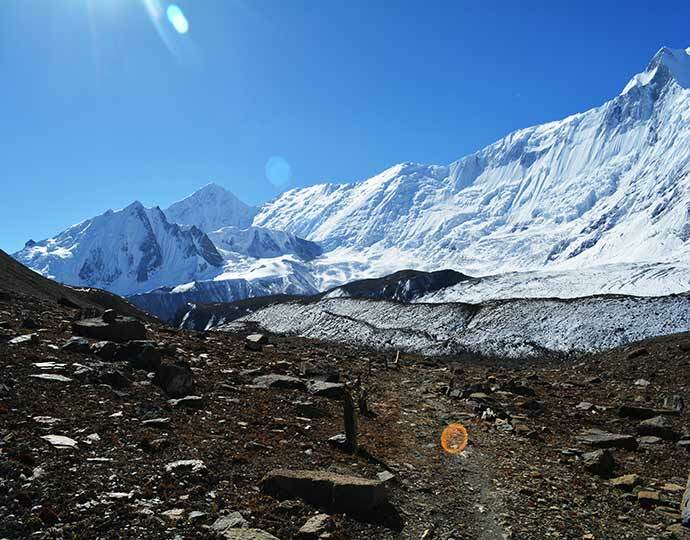 Sight on the solid mass of Nilgiri, Dhaulagiri and Tukuche Peak (6hrs). We follow along the windy kali Gandaki river through Jomsom and reach Marfa, the apple garden, where you can test the apple brandy. 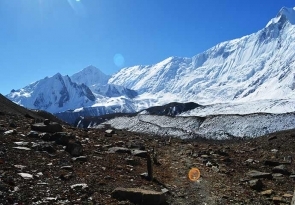 which appears with the pay of Dhaulagiri. 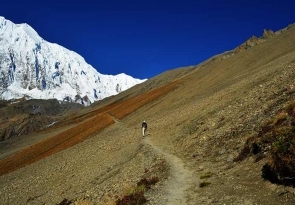 Seen at the fall of ice of beautiful Dhaulagiri cross in forest one let us rejoin the hot sources with Tatopani. Tatopani consists several clusters of building with excellent food, hot spring and nice view of Nilgiri Mountain. Sipping your beer as you enjoy your soak, drinking in the lovely atmosphere and surroundings of the riverside. 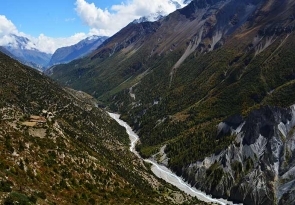 Easy increase until Birethati and crossing by Modi river and descent up to point to join the track by bus to Pokhara o/n in a hotel. Spend the days relaxing/Sightseeing in this lovely town, with it’s wonderful lakeside setting. Overnight in a hotel. An early start to take the tourist bus back to Kathmandu. 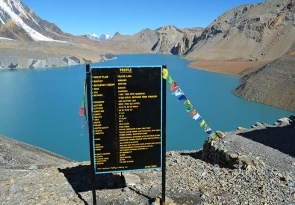 We got in touch with Jagat and his company “Himalayan Leaders” from Germany. The organization went perfectly and without any problem. Once we arrived in Nepal, everything was already organized, starting from the airport pick up to the already acquired permissions for the ACA. 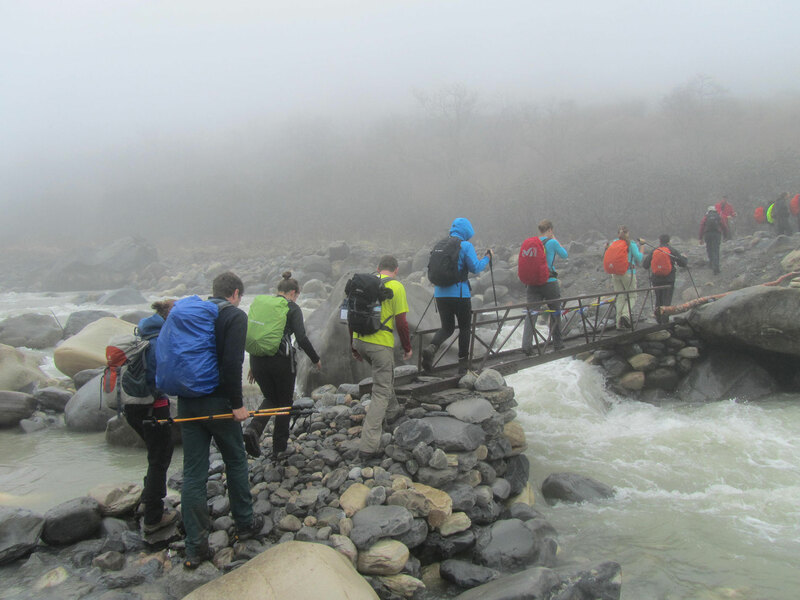 We had then one day in Kathmandu before we got picked up at our Hotel and started the journey to the Annapurna Conservation Area. All the time we were accompanied by a guide. In the first lodge, we met our guide Hem Loppa who was going to lead us through the area for next couple of weeks. He is the best guide we could have asked for and I can only recommend him heavily for every trekker/trekking group that like to have a friendly and competent guide who has a great personality! The trekking tour was awesome and without any incidents. 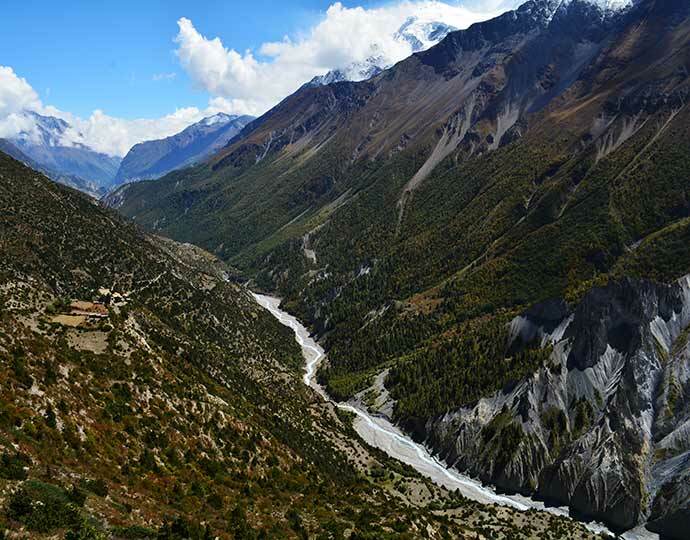 Hem told us everything about the culture and the surrounding mountains and peaks. After 17 days we were transferred back to Pokhara from Nayapul. In Pokhara, the “Himalayan Leaders” even helped us to rent Mountainbikes to do a short 1-day-circuit around Phewa Lake. Transfer back to Kathmandu the next day went also well. All in all, I can only recommend this great organization to every adventure loving person. The planning is just perfect and you won’t have any problems during the trip. The guides only now the best lodges and will take care of you in any way. 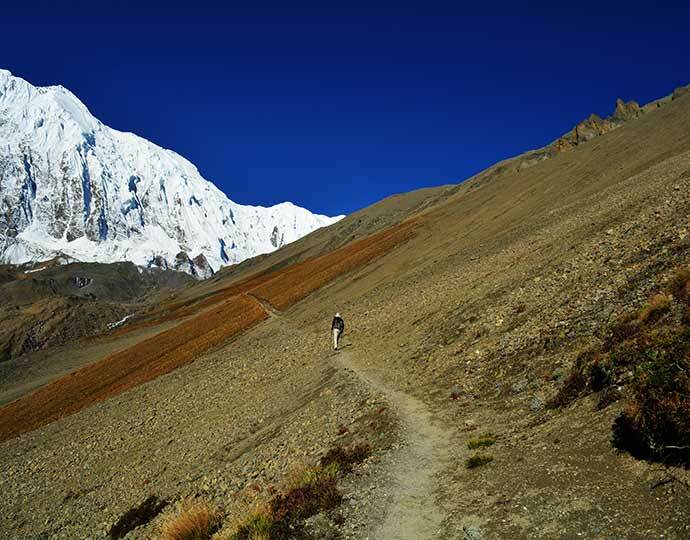 If you are planning to go to Nepal choose the “Himalayan Leaders” and have the trip of your life!